A couple of weeks ago I walked in to Myer in Perth, and was chatting to the friendly sales guy at the LEGO desk. We were talking about the new sets released, and he said “My easy favourite is the one with the portaloo!”. At that stage, I had no idea that one existed. He took me over, and as soon as I saw it, I knew I would own it in a very short amount of time! It’s one of the first LEGO sets that’s made me laugh – that in itself was a reason to buy it. I’m really enjoying the Construction subtheme for City this year. There are some really exciting sets around. I’ve also got 60074: Bulldozer, and will try to finish off the subtheme soon. 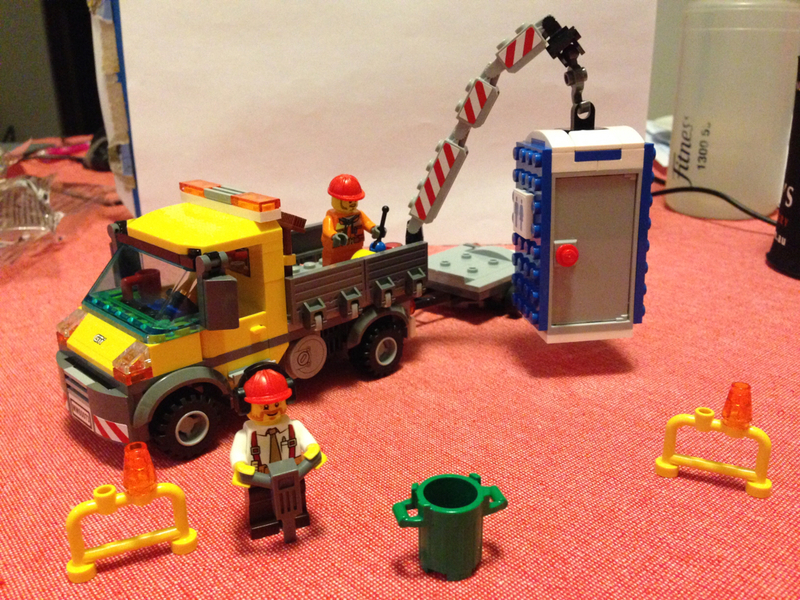 Included in this set is the service truck, the portaloo and trailer, and 2 worker minifigs. In the box you can expect 3 parts bags, an instruction booklet and a little sticker sheet. There aren’t all that many exciting parts included with this one, but I did like the 2×4 wagon sides, the crane parts, and the toilet seat (actually a lifebuoy). 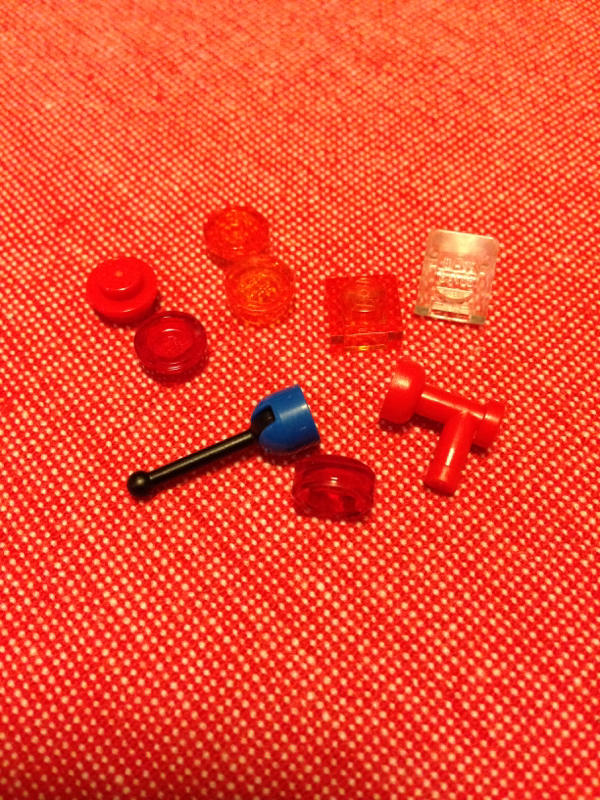 I always like getting minifigure accessories in sets, and as common as they are, I still like getting more brooms, shovels, dustbins and especially the jackhammer. They are just so versatile, and can make a display look so much better. One part that is new, and introduced into every set in the 2015 Construction subtheme, is the combined helmet and ear protection in one (helmet no. 68). I like this one much better than the separated ones. They seemed a little flimsy. 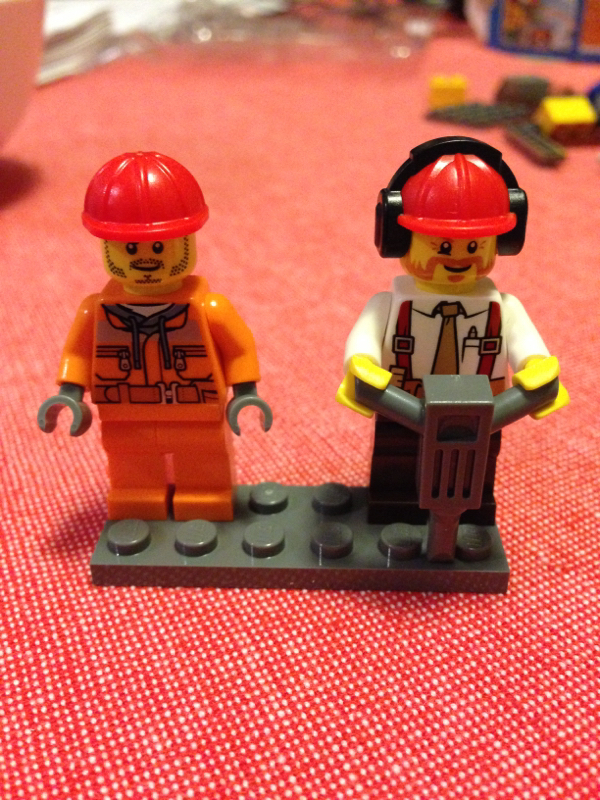 This set includes two minifigures. 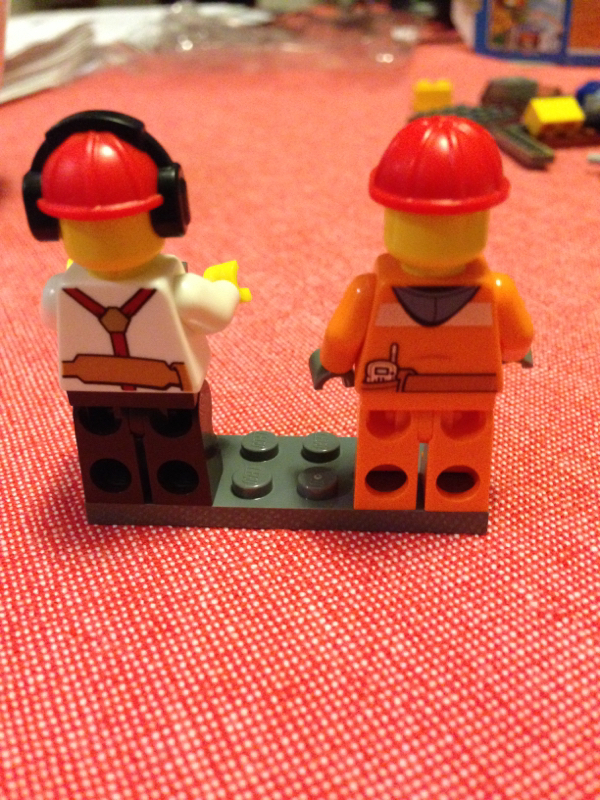 There’s the construction worker in his orange hi-vis gear and orange hoodie (he’s appeared in pretty much every construction set LEGO has produced), and a new one – a white-collar construction worker with a tie – most likely the foreman. 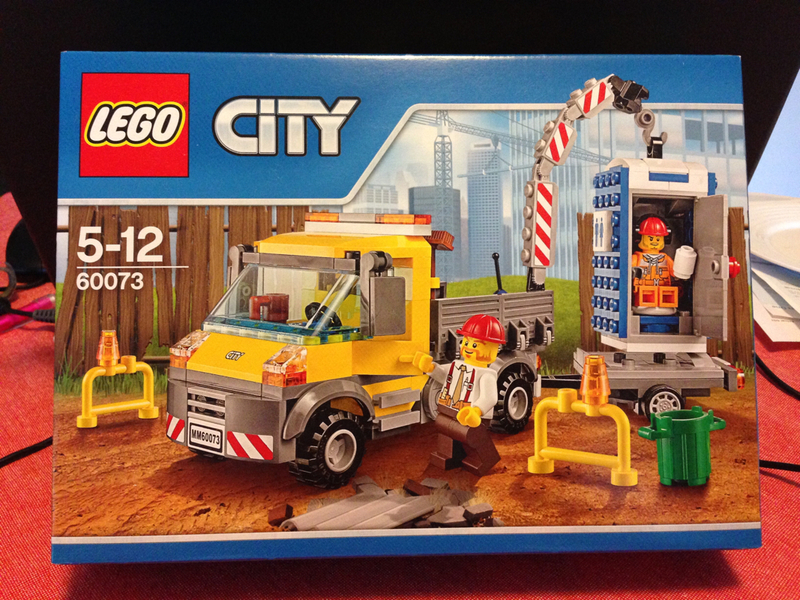 He’s in one of the other 2015 construction sets (60072 Demolition Starter Set), so he’s worth getting when you can. Both have printing on the back as well – braces and tool belt back for the foreman, and hood, tool belt and radio for the construction worker. There’s a heap of detail in this set, including a control panel for the loading crane, and a whole stack of gear you’d expect to see in the back of a service truck. The main drawcard for this set is obviously the portaloo, and it’s bang on for details. I would have loved to see the male/female sign as a printed part, but a sticker was chosen instead. There are a fair few stickers in this set, so if you don’t like your stickers, steer clear, or just don’t put them on. You’ll probably have to suffer through the ones for the loo though, it just doesn’t look right without them. 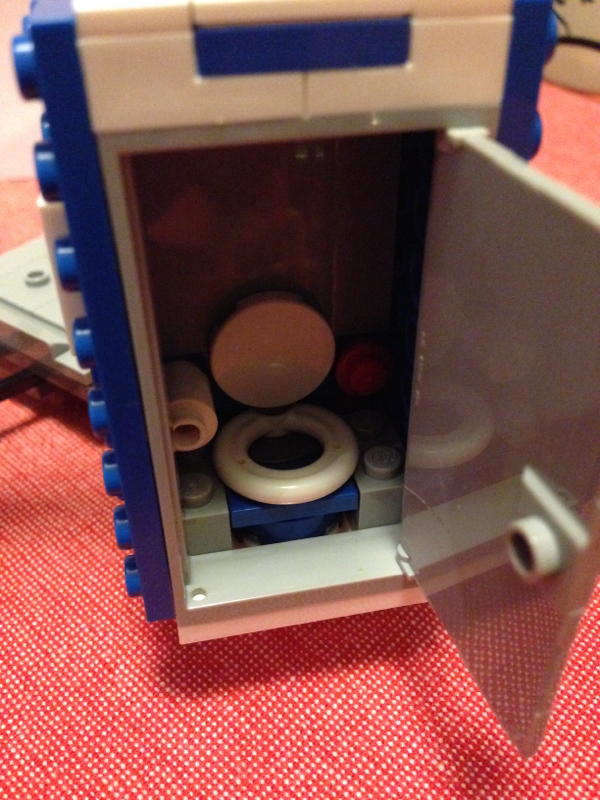 Inside, the toilet looks great. All the details are there! I was really impressed with this one. 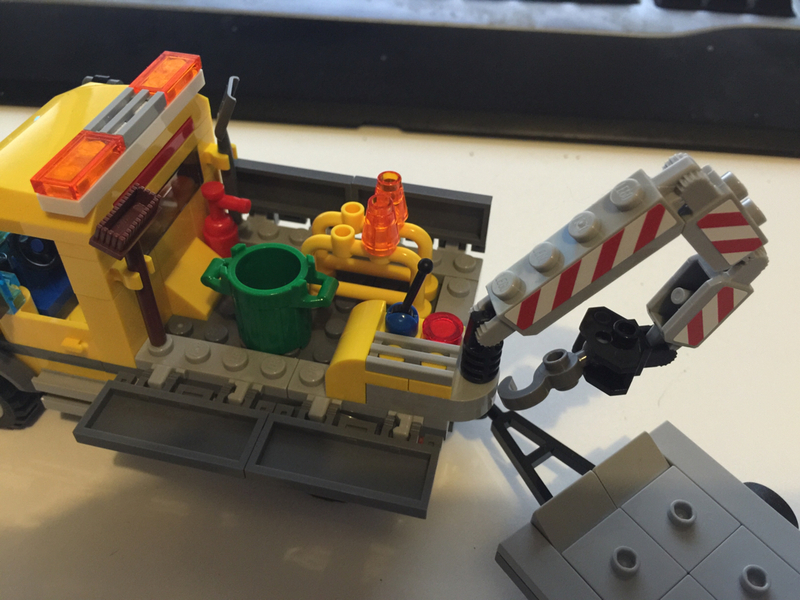 The truck itself has a pretty standard cab for a LEGO vehicle, down to the mug of coffee on the dash, but the good details are in the tray. You get 2 traffic barriers, a fire extinguisher, bin and some tools, as well as the crane and control panel. The sides of the truck also fold down for easy access. I quite like the detail for the fuel tanks, but again, these could have been a printed part. They would definitely be used in other sets. The trailer is pretty simple, and works well with the set. Overall, I’m pretty happy with this set. The portaloo is going to be very versatile! This one gets 8 out of 10 toilet rolls. 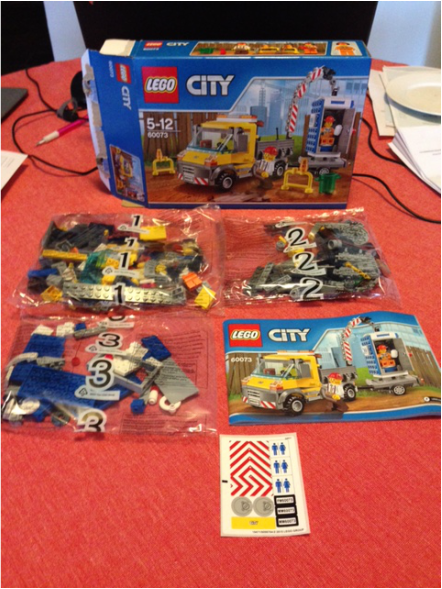 Next up will be 10246: Detective’s Office. This was a mammoth build, with so many details, so I’ll be spreading this one out over 2 weeks. Stay tuned!